Well I am finally settled back in at home. The weather for today was questionable but by 10 am it looked good enough to take a shot. I fueled up the 27′ Contender, trade in, at Sea View Harbor and ran from GE Inlet to Cape May. Mo got to Cape May Marine where I picked her up and we shot out to the DE Bay with a bushel of clams and 4# test. We started on the end of the incoming at the 20 Foot Slough and had one good bite right away that didn’t connect, then proceeded to catch dogfish one after another. At 5:00 pm with the tide slowing down we made a move outside to Pintop and got there with the tide just barely trickling in. We were in 24′ of water and the water temperature was 59 degrees. It was game on. We had 6 hookups on the 4# test, one round was a triple header. 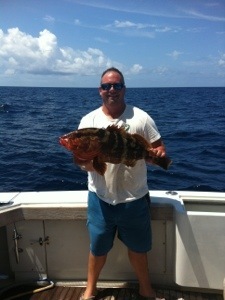 We got one puppy drum to the boat and released it which I caught while Mo was on another better fish. It was pretty fun, and its surprising how much pressure you can actually put on a fish with 4# test. 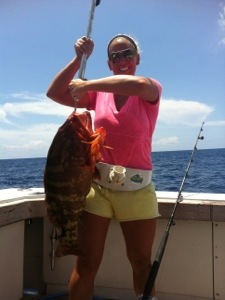 At 7:28 Maureen hooked into another that she fought for a while. 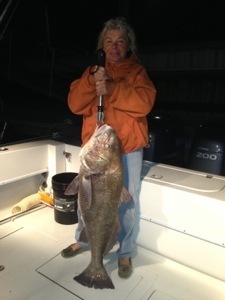 We ended up having to pull the anchor and chase the fish and 8:42 we stuck a gaff in a nice black drum. 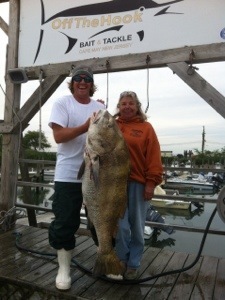 We weighed it with the boga and it was 1.5 lbs shy of the women’s IGFA 4# test line class record. We called it a night and ran back home. Well my time here in Cat Island is over. Got in some decent marlin fishing during the Billfish Blast and had a lot of fun. The staff at Hawks Nest were fantastic and they do everything they can to make sure everyone that goes there has an awesome time. It’s been fun, but its time to get back to New Jersey and get the fishing started there!